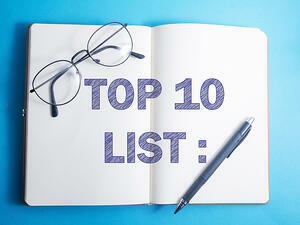 Every year since 2009 we’ve picked our top 10 list for the year. People often ask, what does it take to get on this list? It’s a reasonable question — some of our previous picks haven’t yet reached widespread use, while others may be on the cusp of becoming widely adopted. What we’re really highlighting is something that we think has the potential to have either a long term or profound effect on our lives. We aren’t always right but we find it interesting to reflect on the previous year and highlight our top 10 items. 1. Adding CoreBiome and Novosanis to our product and service family: We started 2019 off with a bang as we acquired two companies, both innovators in their respective markets that will add differentiated products and services to our offerings for both the genomics and microbiome markets. While technically a 2019 event (and not 2018 as this list suggests), its significance warrants inclusion on this list. CoreBiome leverages DNA Genotek’s leadership position in microbiome sample collection with end-to-end laboratory services for sample processing, sequencing, and bioinformatics. Novosanis’ urine collection technology expands molecular collection portfolio and advances DNA Genotek’s expertise in non-invasive sampling. We couldn’t be more excited to add these successful companies to our portfolio of offerings. You can read the full details here. 2. Third-Generation Sequencing - the third revolution in sequencing: Over time, DNA sequencing has come a long way, sparking a variety of sequencing revolutions. According to researchers Erwin L. van Dijk et al. from the University of Paris-Saclay, we have entered the third revolution introduced by the emergence of long-read technologies with skyrocketing popularity. Next generation sequencing (NGS) was only able to perform short-reads so for research that was in need of sequencing longer reads, Third-Generation Sequencing (TGS) technology was developed. These new technologies enable exploration of genomes at a novel resolution and expectations are that TGS will become the new standard in DNA sequencing. 3. Harvard Nurses Cohort study: In 2018, Harvard T.H. Chan School of Public Health launched the Biobank for Microbiome Research in Massachusetts (BIOM-Mass), with the intention to create the world’s most comprehensive human microbiome specimen biobank, using samples from more than 25,000 individuals from the Harvard-based Nurses’ Health Study II (NHSII) and other long running studies. The researchers will use OMNIgene microbiome collection devices to catalog the microbiome profile across multiple body sites from study participants, combining that data with individual lifestyle, health, and genetic information that has already been collected. This will enable multiple research initiatives that could lead to the discovery of new predictive, preventive and therapeutic strategies for a broad range of diseases. This study is indicative of the type of large-scale multiomic projects we expect to see more of in the future. 4. Spit for Science success: One of the most exciting genomic research projects from the past year is The Hospital for Sick Children’s Spit for Science, which aims to understand the genetics of psychiatric disorders by collecting data and DNA saliva samples from youth aged 6-17 years. Study recruitment, conducted at the Ontario Science Center, was extremely successful with over 17,000 children participating over two summers. One of the most exciting findings was identifying the first genome-wide loci for OCD traits using GWAS. Spit for Science had such resounding success that Spit for Science II has already been funded and will involve recruiting an additional 30,000 participants at the Ontario Science Center starting in the summer of 2019. 6. Adoption of precision medicine in health-care systems requires comprehensive plans: Again in 2018, a reference to precision medicine makes our top 10 list. In 2018, we were no longer debating its promises to improve patient outcomes, but the industry has begun to recognize that much is unknown about its adoption within health-care systems. Multiple studies in 2018 pointed to a comprehensive implementation plan being required to realize its benefits. Items identified include precision medicine infrastructure, big data, resources, practice, and education among other activities and outcomes. Every year we see significant progress and new challenges; 2018 has shown promising new models that health-care systems can use to facilitate the adoption of precision medicine. 7. The trend to transformative microbiome research: In 2018, we saw significant advancements in transformative research for the microbiome. If you think of the classic pharmaceutical company drug-development model – it takes many years and billions of dollars to move a novel therapeutic from the drug discovery stage to the post-market surveillance stage. Attrition rates between Phase 1, 2 and 3 can be as high as 50%. Conversely, there are a number of start-up microbiome companies that have successfully moved from proof-of-concept to late-stage clinical trials, in significantly less time and for a fraction of the cost (eg. Vedanta Biosciences, Seres Therapeutics and Indigo Ag). Starting the drug discovery process in humans and accelerating discovery with data science and systems biology is radical. This transformative approach is changing the drug discovery landscape, allowing new entrants and ultimately showing signs that new therapeutics and useful products can be brought to the patients and consumers that need them faster and with reduced risk. 9. Growing ecosystem of microbiome collaborations: Industry and academia are closely collaborating in the microbiome space. Many consumer goods companies, nutrition companies and food and beverage companies are supporting microbiome research within their own product development labs and fostering exciting new ventures. They are using research data to develop better products, new business models, tighter relationships and more personalized products. We saw this evolve in genomics but it’s happening much faster in the microbiome space. It will be exciting to watch this progress further in 2019. 10. Direct to consumer multiomic offerings: One of the things I like most about my job at DNA Genotek is the opportunity to speak with customers who are breaking new ground in the fields of genomics and microbiome. In 2018, I had a chance to speak with Sergey Musienko, CEO of Atlas Biomed. Atlas Biomed, based in the UK, is defining a new market by offering direct-to-consumer products for both genomic and microbiome analysis within the European market. Atlas focuses on personalized information about your health, from your DNA to your microbiome to how much you exercise, bringing all of that data together and making predictions about your predisposition to any number of conditions. Many of today’s most common diseases are multifactorial: while genetics plays a role in how likely you are to suffer from obesity or type II diabetes, there are a large number of other factors to take into account. Could this be the next wave in precision medicine? These are the stories we were watching in 2018 and we’ll be keeping our eyes on them as we move into 2019 and beyond. Today is the most exciting time to be involved in the genomics and microbiome space. We predict tomorrow will be even more exciting. Did anything on our 2018 list surprise you? Did we miss anything you think should have been included? Leave a comment and let us know.